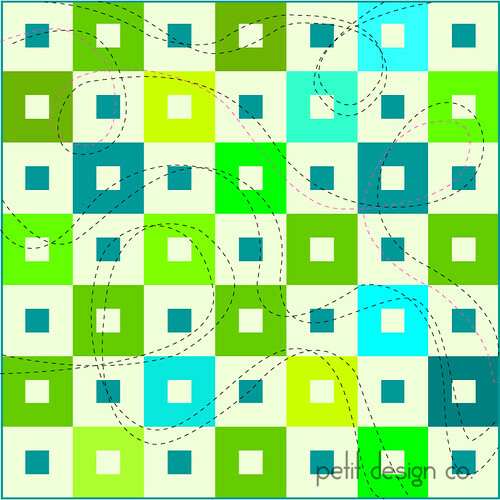 One of the easiest free motion quilting designs is “loops.” We can modify this design for walking foot quilting quite easily. First we need to go bigger. Curves are easier with a walking foot when they are bigger and curve gently. To add interest I like to double up my lines. Rather than echo the lines at a set distance I like to echo them randomly. Wide in some places and narrower in others. To add even more interest I cross my stitching lines once in a while and then continue echoing on the other side of the stitching line. This gives the appearance of ribbons dancing across your quilt top. If you don’t want to make loops you don’t have to. Take a look at the ribbon in the middle of the quilt. It doesn’t loop at all yet is much more interesting than random single squiggles. The second ribbon from the top shows the echoing a little bit better. The black “thread” would be my first pass and the “pink” thread would be my echoing line. This design would work well for charity quilts that use different ribbons to represent them such as breast cancer, military, heart disease etc. sure like 'ribbons' ... looks easy, and add a lot of pizzazz! thanx again for this tute! I like the ribbons, too. I'm definitely going to give ribbons a try! It has a very whimsical look that appeals to me.